Sub-4m sedan segment witnesses significant drop in month-on-month sales. The Dzire continues to lead the pack but yields some space to the Amaze. The Amaze was the only car to register positive year-on-year growth. Aspire and Tigor witness biggest sales drop month-on month. Ameo and Zest continue to struggle at the bottom. The sub-4m sedan segment witnessed a tremendous downfall this February. And that holds true for the Maruti Suzuki Dzire as well, which has for long been leading the sales charts. 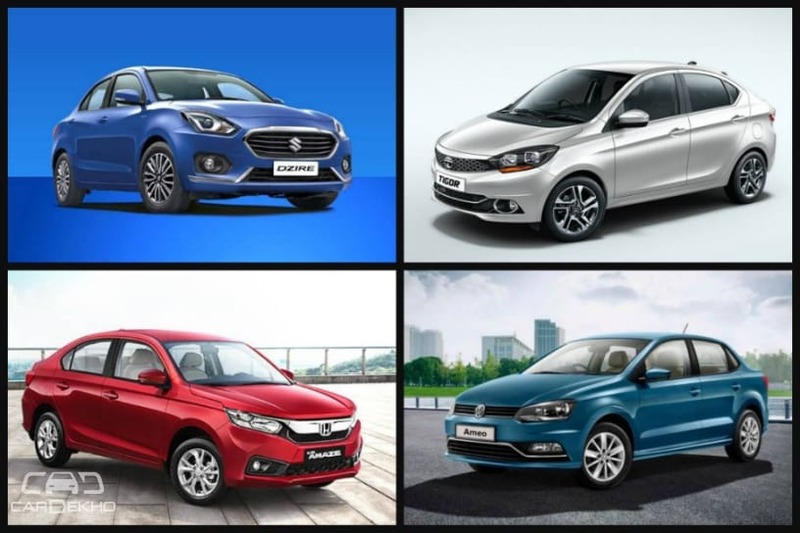 We got hold of the February sales figures of the sub-compact sedan segment recently and this is what the numbers reveal. A downfall: The whole segment witnessed sluggish sales in February but the biggest loser is the Tata Tigor, which lost its nearly 50 per cent of its clientele in a matter of one month. The Hyundai Xcent was the only car that was least affected by a downturn in the market. Dzire on top: When it comes to the top two cars in the segment, the story remains same as the past many months. The Maruti Dzire retains the top spot while the Amaze remains a distant second. The two Japanese sedans command more than 80 per cent of the market share together, which has helped them establish a near-irreversible lead over all other rivals. Honda Amaze on the rise: The Honda has managed to increase its hold on the year-on-year market share by 20.44 per cent thanks to a thorough refresh in 2018. Currently, the Honda Amaze commands 23.36 per cent of total segment sales and is the only offering to have showcased a positive growth in comparison to the previous year. On the contrary, the Maruti Dzire’s market share witnessed a drop of 9 per cent but is still more than half of all the cars combined at 56.67 per cent. Drastic effects: The Hyundai Xcent remained the least affected by the sales downfall in February as it lost around 200 units, or 9.28 per cent of sales, in comparison to the month before. The same can’t be said for the Tata Tigor which lost 46.76 per cent of Feb sales against January. Aspire fails to inspire: The Ford sedan, despite a relatively recent refresh last year, saw its sales plummet to just a 1000-odd units from more than 1500 a month ago, making for a drop of 33.26 per cent. The Tailenders: Volkswagen Ameo and Tata Zest traded some blows as the two exchanged the last spot in January and February. While the Zest took the last spot in January, it managed to hand it over to the Ameo in February. The Tata Zest and Volkswagen Ameo occupy a 2.75 and 2.21 per cent of the overall sub-4 metre sedan segment.